Some of you might know that I moved to Dallas from Los Angeles last year. But what you definitely didn’t know was how much I missed my girlfriends in California. So much, in fact, that we decided to plan a much-needed vacation to the beautiful Greek Island of Mykonos. A couple of my friends have been there before and couldn’t stop raving about it. So not only was I excited for this trip, I was excited to reconnect with my besties from LA. After landing in Athens, I still needed to take another 25-minute flight to get to the island. But once I arrived, it didn’t take long for the fun to begin. Coincidentally, I ran into more friends from Miami and LA, which was amazing! Not that we were short on fun – I was already staying with eight other girls! 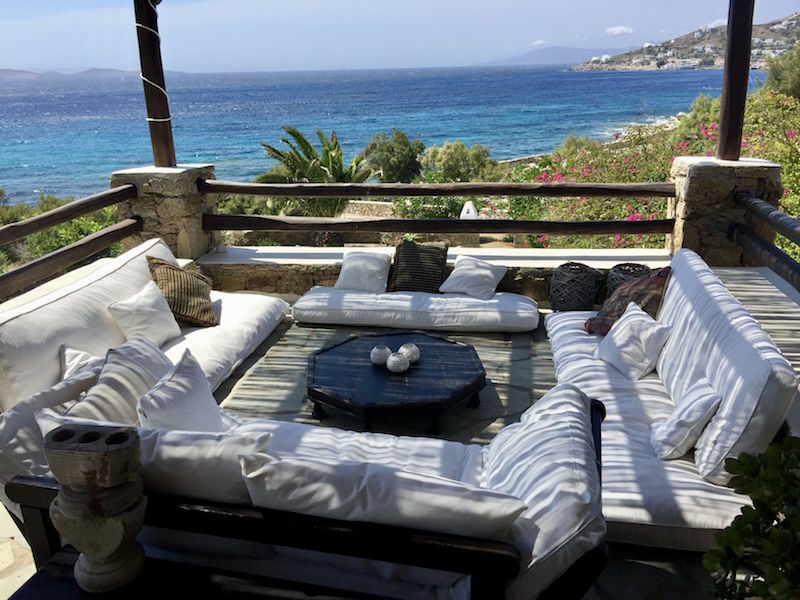 Our week-long stay on Mykonos started at the Maera Villas – a luxury villa that features a highly specialized concierge service for their guests. Our villa (Villa St. John) was located on the secluded beach of Agios Ioannis. The 2-story villa was a spacious 220 square meters (that’s about 2300 square feet for my American-born friends) and could comfortably house about 10 people. Located at an idyllic spot on the Southwest corner of the island, this gorgeous villa is perched high up on a cliff and featured breathtaking panoramic sunset views. It also had direct access to a secluded beach just steps away from the property. Villa St. John was also well-equipped for a big group of travelers: a fully stocked kitchen, a communal swimming pool, 3 outdoor lounging areas, 5 bedrooms, 4 bathrooms and an outdoor BBQ area. Apart from the aesthetic appeal of the hotel, I also loved the excellent level of service we received. It came with an airport meet & greet, bespoke concierge, daily maid service, daily towel change, change of linens twice weekly. Other extras included a boat charter, massage, yoga sessions, chef, barman, and wait staff were also available upon request. Amazing, right? When we arrived at the villa, a very friendly gentleman carried ALL of our luggage for us. We were astonished at how well he maneuvered through the labyrinth of stairs needed to get to our villa. He must have gotten a killer leg day workout that day from carrying all of our bags! After a tour of the villa, I immediately unpacked (so I could plan my outfits easier) while getting settled in with my roommate, Kristina. Kristina and I shared an upstairs room with a cute balcony and amazing ocean view. As the oldest of 4 girls, I was feeling a little nervous. I mean, was I going to turn into a control freak or have to compete for time in the bathroom? Thankfully, Kristina was a dream roommate – she never took too much time to get ready in the bathroom and we got along great! For lunch on our first day, we went to Alemagou – a trendy, new restaurant with great food and an amazing vibe. We even spotted Lindsay Lohan having a blast at the table next to us. The food here comes from traditional Greek recipes – simple, elegant and tasteful. 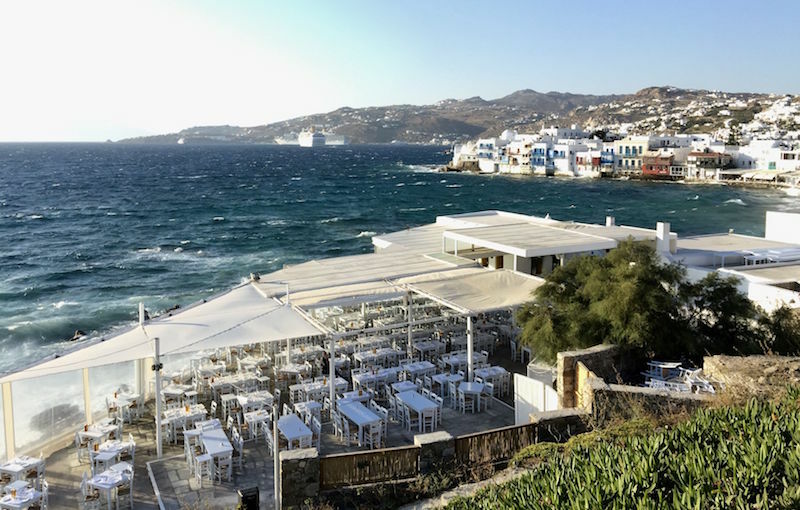 Dinner was then spent at Sea Satin, which is located directly under the famous Mykonos windmills, giving us a picturesque view of the spectacular scenery. This Sea Satin is known as one of the best seafood restaurants in the area. So, if you love seafood, add this to your must-visit list. Another restaurant we loved, and ended up eating at just about every day, was called Nammos. The atmosphere is very mellow during the day but picks up steam as the glow of the afternoon fades into evening. How do I know? Well, we always ended up letting loose and dancing on the tables after a few drinks! Scorpios is another note-worthy spot – it has a great party scene with the added bonus of an amazing sunset view. And If you have a sweet tooth, and are looking for the perfect dessert spot, I highly recommend Happy O ice cream. Overall, there were tons amazing restaurants and clubs and it felt like you could never really run out of great places to go. My girlfriends and I had a wonderful time exploring our island neighborhood. We would usually end our late night trips at the very popular Jimmy’s Gyros, which was THE hangout spot for after-hour munchies. During one of our late night visits to Jimmy’s I actually saw Bella Hadid, my ultimate girl crush, casually taking an order from a random customer who had NO idea who she was! We capped our Mykonos girls’ trip with a visit to SantAnna Mykonos – a really cool hotel with very unique architecture. We got a private tour of the property and were blown away by the VIP rooms built underneath the swimming pool. Even though we didn’t spend a lot of time there (it was too windy that day to hit the pool or the beach) we still had a great time just chilling out in their cabanas. Overall, Mykonos exceeded my wildest expectations. My girlfriends and I enjoyed trying out new Greek food, discovering the best restaurants, experiencing the rich culture and just taking in the stunning views everywhere we went. Every corner of the island is just gorgeous. There are countless of places to visit like Little Venice, Matoyianni Street, Lena’s House and even the dozens of lighthouses. By the end of my Mediterranean vacation I felt even closer with “my girls” as well as an incredible appreciation for the stunning island of Mykonos and its people. I can’t wait to go back there again soon! By the way, I’ve been thinking of making a simple “How to Pack for a Trip to Mykonos” blog. Leave a comment below, if you want me to do this next!